EDIT: Giveaway is officially closed. Congratulations to Brenda Witherspoon for submitting the randomly chosen 178th entry. If summer is rushing by you, take a moment to stop and smell the roses. Or rather, pick the rose colors. 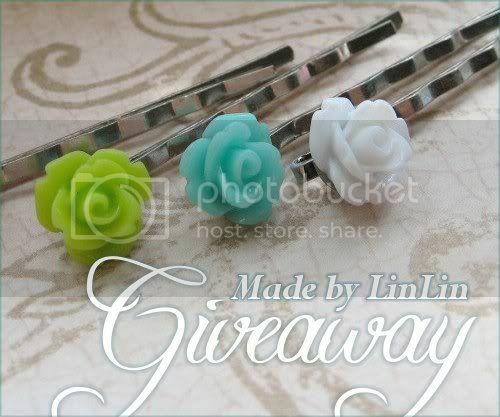 Lindsay of Made By LinLin is giving away a prize pack of pretty rose accessories. One lucky lady will win 2 rose stud earrings, 2 bobby pins and 1 brass ring - in any color she chooses! 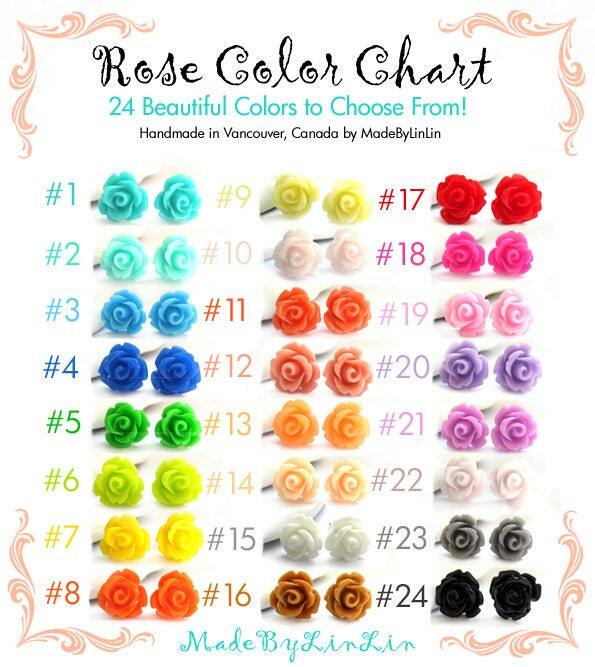 Gaze upon all 24 available colors through Lindsay's rose color chart. The rainbow is so beautiful - I don't know how anyone could just pluck one! Judging by the 5,000+ sales in her Made By LinLin Etsy shop since November 2011, most customers can't just pick one piece of handmade jewelry from her studio in Vancouver, Canada. It helps that her prices are lower than many flowers grow to the ground! Making affordable, quality jewelry is very important to Lindsay. She is the happiest she's ever been, being able to design and create products for people of all ages and styles around the world. Use the Rafflecopter below to enter to win the prize giveaway before 11:59pm EST on August 20, 2012. Worldwide giveaway is open to people ages 18+. Be sure to leave the mandatory comment on the blog post with the same name you use to fill out the Rafflecopter - all entries by winner must be easily verified or a new winner will be chosen. Please convo aquariann.etsy.com if you'd like to sponsor a handmade giveaway. Item must retail at at least $25. Seller agrees to ship it directly to the winner, anywhere in the world. Hostess gifts are wildly appreciated, but not required. Oh so pretty. I love the bobby pins! super cute!! I love the colored roses on bobby pins!! Owl Stud Earrings are my fav!!! I love all of the earrings! I like the rose necklaces. 24 Pair of ros eearrings! My favorite is the W I N G S - Butterfly Antique Brass Necklace. I love the Grey Rose Stud Earrings. Gorgeous! My favorite item is Lilac Purple Rose Antique Brass Necklace. OO i really really want the rose stud earrins in white or soft pink! I really like the Silver Leaf Earrings. I like the Turquoise Chrysanthemum Stud Earrings. i love the owl stud earrings! I love the pearl beaded hoop earrings. Thanks for the chance. Love those classic rose stud earrings! So many great colors to choose from! I really like the LIGHT PINK - Tiny Rose French Clips Earrings. i am absolutely in love with http://www.etsy.com/listing/93661334/leopard-key-chain-with-rhinestones-115mm! I love the wisdom tree necklace! I love the Wisdom Tree Necklace. Bobby Pins...Bobby Pins....for my unkempt hair! I like the Brass Filigree Necklace. Christina - xristya@rock.com - I love the Royal Blue Stud Earrings! Love the rose bobby pins! I love the black tiny rose French clip earrings. I like the hot pink rose stud earrings. I love LinLin's stuff! I am actually hosting a giveaway of her earrings and ring too--so come on over for another shot of winning! :-) HURRY though, it ends tonight! I like L E A V E S - Silver Leaf Earrings. Owl Stud Earrings are so cute! I love the 2Lilac Purple Rose Antique Brass Necklace". The antique brass locket necklace is hands down my favorite. I love the peach and the lavender rose stud earrings. I also love the light aqua blue rose bobby pin and the orange rose bobby pin. But my favorite one is the owl earrings, that's wonderful. Continous your amazing work. i like the "DREAM - Antique Brass Filigree Bobby Pin"
My favorite item is the Silver Leaf Earrings. http://www.etsy.com/listing/95749776/owl-stud-earrings The owl stud earrings are so cute! I like the Double Wrap Leather Beaded Bracelet - Jade Gemstone Beads. Thanks for the chance to win! I'm on a purple kick right now, so I love the Deep Purple Faux Pearl Kidney Wire Earrings. My favourite item is the Lilac Purple Rose Antique Brass Necklace. - Judith R.
I love the hope earrings. I adore the red copper vines earrings...they match my hair! I love the Black Rose Stud Earrings with Rhinestone center. I really love rose stud earrings!!! they're so cute!! love the rose earrings, the colors are very beautiful! I like the stud earrings. I like the Grey Rose Stud Earrings. The owl stud earrings are adorable!!! I love the double wrapped leather beaded bracelet. The red rose dangle earrihttp://www.etsy.com/listing/92291188/red-rose-dangle-earringsngs. I love the owl stud earrings. I love the blood red rose bracelet. I love pearls so I'm giving my votes to Faux Pearl Kidney Wire Earrings, and I love all the colours! My favorite is definitely the Aqua Beaded Bracelet. My favorite is the SHIMMER - Beaded Hoop Earrings. I love the pink earrings! Love unique jewelery...so pretty and colorful.